Purify and detoxify summer skin with a mask from Neutrogena, Life Brand and Montagne Jeunesse! Neutrogena Deep Clean Purifying 100% Hydrogel Mask - 30g - $3.99 - instantly hydrates and refreshes skin with something so not your typical paper mask: it has 100% hydrogel material with seaweed extract that contains 50% more essence than ordinary paper masks, contours to the skin and seals in the formula for optimal absorption leaving skin purified with a healthy glow. It's easy to use, just apply the gel mask to your face and leave on for 15 to 30 minutes. Remove the mask and massage remaining product into face and neck, then rinse with water. Life Brand Detoxifying Mud Mask - 15ml - $1.99 - with a paraben formula containing a special blend of minerals and herbal extracts including Montmorillonite clay, charcoal and ivy extract to detoxify and purify skin. 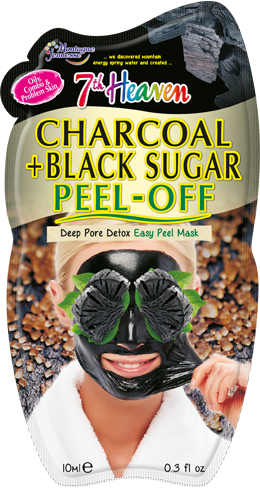 Montagne Jeunesse 7th Heaven Charcoal + Black Sugar Peel Off Mask - 10ml - $1.99 - with cleansing purified activated Charcoal to draw out deep down dirt and impurities mixed with a spoonful of black sugar to revitalise, hydrate and smooth skin along with witch hazel to soothe for glowing skin that feels squeaky clean and sensationally soft. Available at select Brunet, Familiprix, Guardian, IDA, Jean Coutu, Lawtons Drugs, Pharma Choice, Pharma Plus, Pharmasave, Rexall, Uniprix and Value Drug Mart stores across Canada.